How much does it cost to travel to Huaraz? 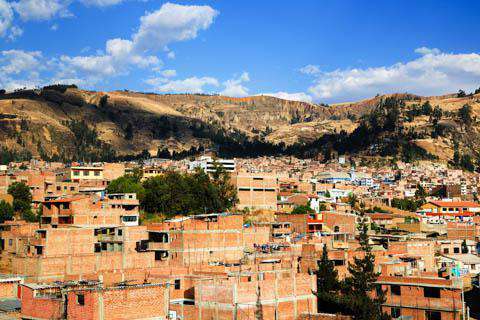 How much money will you need in Huaraz? S/.74 ($22) is the average daily price for traveling in Huaraz. The average price of food for one day is S/.23 ($6.89). The average price of a hotel for a couple is S/.56 ($17). Additional pricing is in the table below. These average travel prices have been collected from other travelers to help you plan your own travel budget. How much money do I need for Huaraz? Huaraz is a large town in the Cordillera Blanca region of Peru's Central Sierra. Huaraz stands tall at 3100m; travellers from Lima might need a day or two to acclimatize to the change in atmosphere. Nearly wiped out by the earthquake of 1970, the town of 100,000 blends a mix of modern and native culture. Huarez is first and foremost a trekking metropolis. During high season the streets buzz with hundreds of backpackers and adventurers freshly returned from arduous hikes or planning their next expedition. The town has many markets, shops, quality restaurants and hopping bars catering to tourist and local needs. Mountain adventures in the off-season can be equally rewarding, but the vibe is calmer and some places go into hibernation once the rains set in. Huaraz sits at more than 3000m, so if you've just crossed the border from Ecuador or have been relaxing on the beaches of northern Peru, you will need to acclimate yourself to the altitude and take it easy for the first day or two before you are in condition to hike all day. Explore this traditional little town and its local markets. Most of you aren't going to leave Peru without at least one llama themed jumper or a ridiculous hat. Instead of buying them in Cusco, get exactly the same products from one of the many street sellers in Huaraz for a cheaper price. Hang out in one of the many small parks, practice your Spanish or go taste delicious traditional Peruvian food. If you have time, visit Chavín de Huántar, an archaeological site from the pre-Incan Chavin culture containing 3000-year-old ruins and other artifacts. The site is a designated UNESCO World Heritage Site and opens from Tuesday to Sunday, 9h to 16h. The entrance fee is USD$3 for adults and USD$1.50 for students. The access point for trips to Chavin de Huantar is Huaraz, 3 hours away on a rather poorly maintained, unpaved road on the side of a mountain. Several bus companies located on Mariscal Caceres avenue offer regular departures throughout the day to Chavin for USD$5 and some agencies offer a package transportation with a guide for USD $12. Several buses to destinations further afield does stop at Chavin around midnight, but then you'll need to have accommodation sorted out ahead. You might also be able to find shared taxis and combis. Another option is to go for a beautiful three-day hike, on an Inca trail, between Olleros, south of Huaraz and Chavin, but make sure you hire a guide, from one of the many tour agencies. The gateway to the spectacular Cordillera Blanca, Huaraz has become northern Peru's epicentre for adrenaline fuelled activities and outdoor lovers' dreams. For hiking lovers, this place simply has to be on your Peru itinerary. Whether you fancy a one day hike to Laguna 69, or a multi-day trek through the Cordillera Blanca, all can be arranged or started from here. Huascaran National Park, covering nearly 340,000 hectares, is a designated UNESCO World Heritage Site home to some of South America's most breathtaking scenery and glaciers with 25 trekking routes and 102 mountaineering spots, which you can do on your own or with a tour, and many of these are achievable for anyone with a decent level of fitness. You will need to pay a 10 sole entry fee (USD$3) for one day visitors or a 21-day pass for 65 soles (USD$19). It is not possible to buy multiple day passes, so if you are doing the 4-day Santa Cruz trek for example, you will need to buy the 21-day pass. These are of extremely good value when compared to the costs associated with hiking in Chile's Torres Del Paine, another famous hiking spot in South America. Easier hikes whilst acclimatizing include Rajucolta Valley and Llaca Valley whilst Laguna Churup, Laguna Paron and the Laguna 69 are more challenging. For the truly adventurous, consider then hikes through the gorgeous Cordillera Huayhuash, the Santa Cruz Trek or the Quilcayhuanca & Cojup Valleys. These hikes last anywhere from 5-14 days so take precautions and find a good guide or tour provider. If you want to explore the area differently, there are various places in town that can rent you a bike - either for a single day cruise or a 12-day cycling marathon through villages and over mountains. No trip would be complete without getting to know the local cuisine and a trip to Peru would definitely not be complete without a few bottles of Inca Kola. This mouth wateringly sweet Peruvian classic was actually created by a British immigrant and launched in 1935 to mark the 100th anniversary of Peruvian independence. The nation has been enamoured since then. Huaraz is jam-packed full of local restaurants and eateries and if you know where to head you will get some fantastic, filling, authentic cuisine, all at extremely good value for money. If you want to eat well for not too much look out for the 'Menu del Dia' signs in the local restaurants around town. In Huaraz things are closer to the English tipping culture, rather than the American. A service charge is never included so a 10% tip seems reasonable if the service was good. Huaraz is an 8 hours coach drive from Lima with a simple and a reasonably cheap and reliable service. As of November 2016, only one airline (LC PERU) flies to the Huaraz area. It flies once per day only on Tuesday, Thursday and Saturday. The airport is located in Anta, approximately 24 km north of Huaraz town centre, requiring you to take a combi or 30 minute taxi ride. In Huaraz, taxis are cheap and fast for getting about the town. If you need to rent a car to go out of the city or to start an amazing adventure, there are a variety of companies that make this service in Huaraz.